What is the Phenome Centre Birmingham? 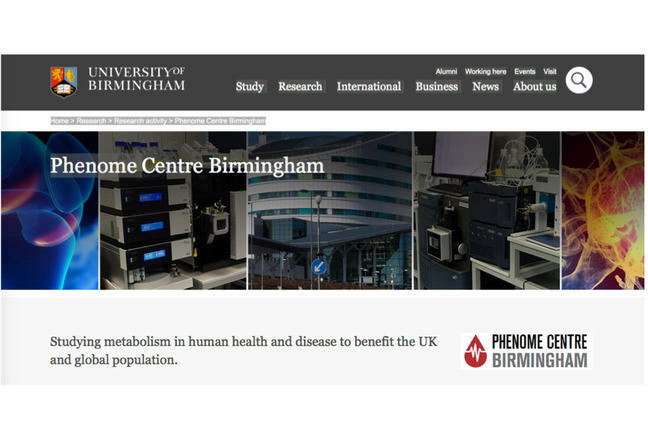 Phenome Centre Birmingham is an £8million MRC, University of Birmingham and analytical instrument company funded facility for large-scale metabolic phenotyping in the clinical sciences. The centre is based at the University of Birmingham in the UK and operates in association with Birmingham Health Partners. The centre was opened on the 23rd May 2016 by Professor Sir Mark Walport, Government Chief Scientific Advisor and Head of the Government Office for Science in the UK. The Phenome Centre operates 11 liquid chromatography-mass spectrometry (LC-MS) instruments and 2 nuclear magnetic resonance (NMR) instruments. This number of instruments will allow us to complete greater than 50,000 assays each year. We collaborate with the first international phenome centre for metabolic profiling, the MRC-NIHR National Phenome Centre in London, which opened in 2013 and is directed by Professor Jeremy Nicholson. The second international phenome centre, the Singapore Phenome Centre opened in September 2015 at the Nanyang Technological University. The international community of phenome centres has now extended to Australia with the opening of the Australian National Phenome Centre in 2017. The objective of Phenome Centre Birmingham is to apply metabolic phenotyping to large clinical studies to analyse many thousands of samples for each study. The phenotypic diversity in the human population is immense and to obtain statistically robust and valid biological conclusions we need to sample the population in a representative manner, here thousands of samples are required to statistically identify small but important metabolic changes. We will analyse blood, urine and tissue samples collected from either the general population in a random approach or from a specific subset of the general population to study human diseases and ageing. Hundreds or thousands of samples will be collected. The earliest developments of applying non-targeted mass spectrometry for studying large sample sets of blood was the HUSERMET project which collected and analysed greater than 3000 samples applying gas chromatography-mass spectrometry (GC-MS) and LC-MS. The centre will focus on projects to enhance our capabilities to perform stratified medicine. Currently, the human population is commonly viewed as the same from a clinical point of view. For example, it is assumed we will all respond in the same way to a specific treatment to cure a disease whereas different people will or will not respond to a single treatment. Stratified medicine has the approach to group (or stratify) patients in to classes of similar phenotypes, with multiple classes defining different phenotypes. For example, there may be two classes, those who respond to drug X and those who do not respond to drug X. For the latter set of patients prescribing drug X would not alleviate the symptoms and therefore drug Y may be more appropriate. This approach allows each patient to receive the correct treatment first time and every time. We will apply metabolic profiling to (1) stratify patients in to groups based on risk of developing a specific disease; (2) identify patients with a disease early via screening which allows early treatment and improved clinical outcomes and (3) identify which drug will provide the greatest efficacy and fewest side effects and which drugs a patient will not respond to. 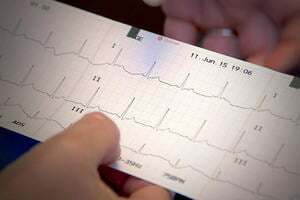 The outcomes of these studies will improve patient outcome and reduce costs to healthcare providers.